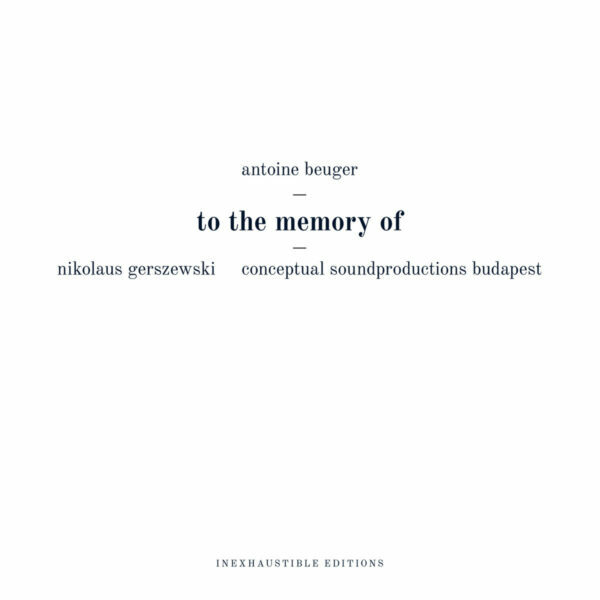 A little piece of new Wandelweiser for your delectation, here courtesy of Nikolaus Gerszewski and his entity Conceptual Soundproductions Budapest (CSB). Gerszewski plays piano and objects, Lenke Kovács vocalises, Ferene Getto uses voice and objects, László Németh plays trumpet, Dorottya Poór violin, Nóra Lajkó and Julien Baillod both use guitar, Andor Erazmus Illés employs electronics and Erik Benjámin Rafael manipulates percussion and objects. 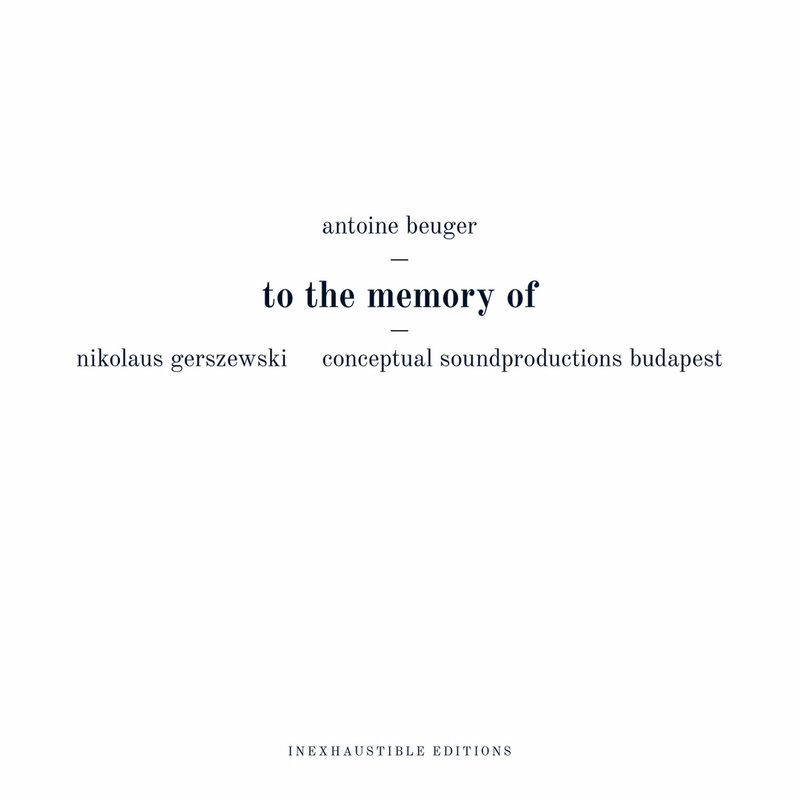 Although to the memory of is a very simple written score, with remarkable clarity and restraint, something along the lines of “sounds, words, silence” – as, perhaps, you might expect from the pen of Antoine Beuger, Gerszewski and co take a vigorous approach to it. Gerszewski says: “…My attitude, as the director of the ensemble, was to view an individual sound as a piece in itself, a sonic object that should be consciously shaped in every aspect, as any other work of art should be”. Of course, the work produced by members of the Wandelweiser collective may not be for everyone, but I personally love the purity of expression of it. Admittedly, a musical concept that favours silence and restraint will probably never be populist, exactly, despite Stuart Maconie’s recent well-intentioned efforts to showcase it on one of his BBC Radio6 programmes. Predictably, Maconie and his guest Andrew Male try not to too obviously play it for laughs when predictably referencing John Cage and “silence” in their good-natured way, but one wonders how well any new or challenging music comes across in this sort of context really. Mostly, the sounds are recognisable as coming from the instruments that made them, although occasionally there is a perplexing surprise: at 15:28 I have absolutely no idea what that is. At 20:45 there’s a scream, I’m assuming it is human, but whether it’s uttered live or it is the playback of a pre-made recording is unknown. One of the nine musicians are responsible for it, most likely either Kovács or Getto, but I’m not entirely sure I could reliably guess who. This unexpected unknowing forces the listener to consider what they have before them very carefully; and not enough music does this to my mind.